Hubby: "Hey boys, you know Mother's Day is this weekend." Me: "Yes, and I want you to be creative this year." 9-year-old: "Give me twenty bucks and I'll see what I can do." It's very clear to me that cluelessness is genetic in the male population. coupons for all sorts of hugs and household chores (that I never actually cashed in - does anyone?). 1. 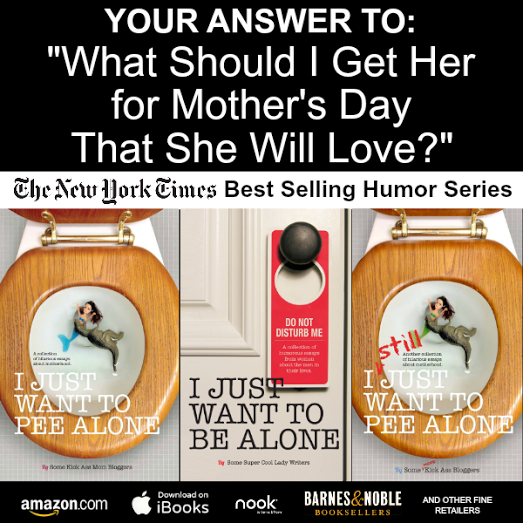 Books: Moms always love a good book, and I've just read two that I love! 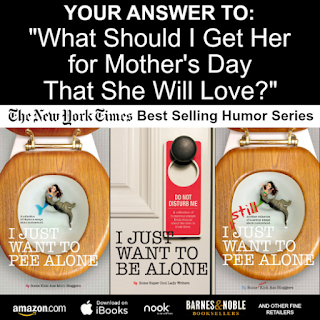 The first is the third installment in the I Just Want to Pee Alone series by the amazing Jen of People I Want to Punch in the Throat. I was in the second book, I Just Want to Be Alone. It is called I Still Just Want to Pee Alone, and right out of the gate it does not disappoint. From the very first story about "The Interview" by Amy of Funny is Family, to the very last story by Jen herself, it is clear that Jen has a talent for picking great storytellers. 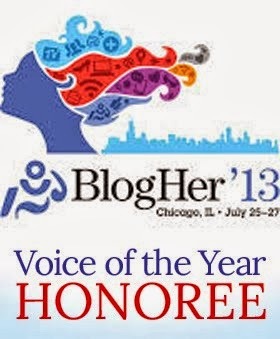 It restores your faith in the fact that most bloggers are, in fact, skilled writers who happen to have blogs. Mom can read one or two stories at a time, or devour the whole thing during a very long soak in the tub. For those who might want something a little more deep, inspiring, and philosophical, another book I highly recommend is Open Boxes: The Gifts of Living a Full and Connected Life by Christine Organ. I have been a longtime fan of her blog; and when she asked me to read her book, I couldn't wait. I was crying after the first chapter, "Divine Kindness in an Old Navy Parking Lot." If you've been that mom whose mothering has publicly been called into question, only to have validation come in the form of a real-life angel, this book is for you. Christie explores topics such as spirituality and parenting, self-acceptance and friendship, bowling with preschoolers, and struggling to find grace in cleaning the toilet (yep, it's true). Through her beautiful and inspiring writing, she urges readers to lift the lids off their compartmentalized lives in order to connect more deeply with the people and the world around them. Just like the above book, this one is easy to read in short bursts; and I guarantee you that you will put it down each time feeling warm, revitalized, and inspired. I've often thought about getting this "Good Day, Bad Day, Don't Even Ask" wine glass for myself, but it might be too presumptuous. There are lots of other funny wine glasses suggested right under these. Pick one for her personality. Mom might also need something to carry her wine in to her next GNO, so here is a cute monogrammed wine sleeve. Everyone will know it's HER bottle. 3. Summer accessories: A mom needs to look her best, even at the pool. I have three simple secrets for accomplishing this. Tinted lip balm from Burt's Bees. I love these cute little things. They come in great colors, which is just enough for a little touch of shine without looking too heavy. Tinted moisturizer from Laura Mercier. Just enough coverage for a summer day, plus SPF to keep mom's beautiful skin protected. Waterproof mascara - perfect for the pool. Put the books and makeup (and maybe even the wine) in this cute carry-all bag for the beach. 4. Keepsake books: I discovered this beautiful book that I'm giving my mom for Mother's Day. There are several different editions, but they all contain prompts and provide space to write. It's perfect for my mom, who loves to write and will love leaving this for us to read someday. 5. A Mom's Day Out with the family: It may seem crazy, but some of us want to spend our special day with our families. A brunch or a trip to one of her favorite places would be perfect. If you are near or in the Omaha area, I have heard of a great idea for a fun family afternoon. 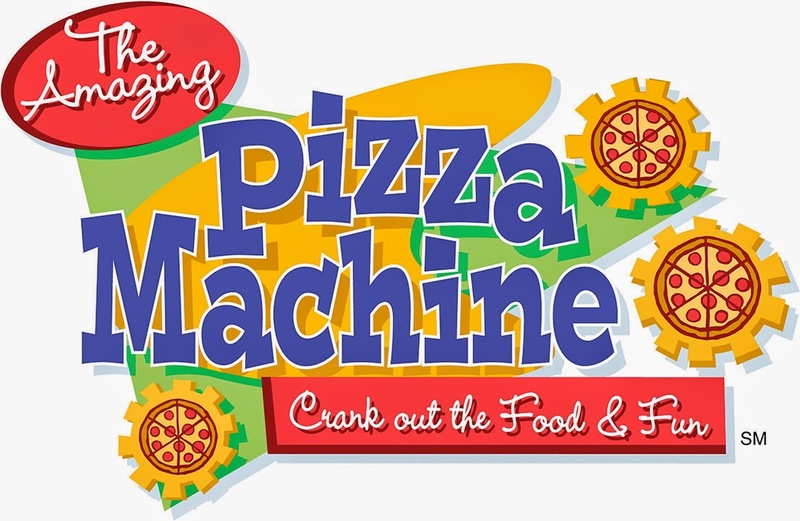 The Amazing Pizza Machine is having their second annual AMAZING MOM DAY this Sunday, May 10, from 10 a.m.-3 p.m. I really love Amazing Pizza Machine. My boys have a blast playing there, there are rides and games that I can enjoy with them, and I love their pizza buffet. It's even the perfect place to go if we have friends in town. Win this gorgeous bracelet from Elisa Ilana. 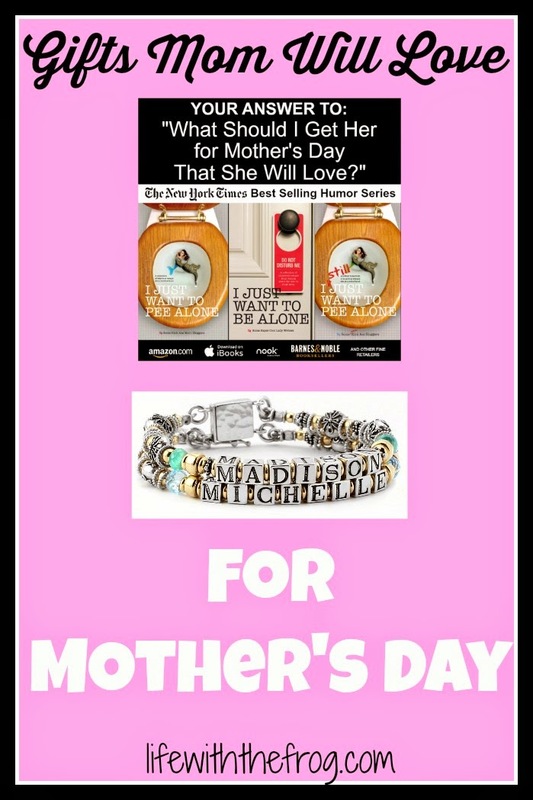 Moms will receive a special deal on this day, too. Mom will receive unlimited brunch buffet and unlimited beverages along with a $5 Big Fun Play Card and two free rides, all for just $9.99. Mom can even enjoy a Mimosa from Luigi’s Libations, Amazing Pizza Machine’s bar. Deals are available for the rest of the family, too. Visit AmazingPizzaMachine.com or call (402) 829-1777 for more information. 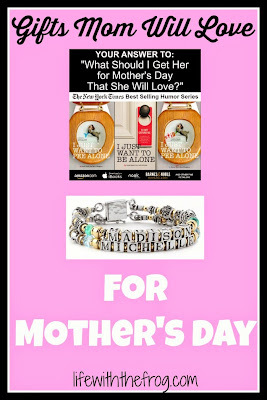 Well, I hope I've given you (and by YOU I mean Hubby and my boys) some great new and different ideas for Mother's Day. Whatever you do, I hope it is a truly beautiful day filled with all the special things you deserve. *Even though I was given products to review, I can assure you that I love all of these things. I hope your mom will, too! !